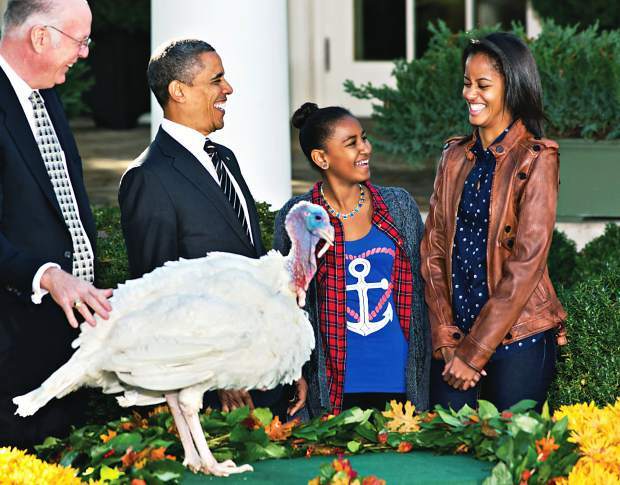 President Barack Obama, with daughters Sasha, center, and Malia, right, carried on the Thanksgiving tradition of saving a turkey from the dinner table with a "presidential pardon," at the White House in Washington on Nov. 21, 2012. After the ceremony, "Cobbler" headed to George Washington's historic home in Virginia to be part of the âChristmas at Mount Vernonâ exhibition. National Turkey Federation Chairman Steve Willardsen is at left. Thanksgiving has many traditions surrounding food, friends, family and football, but the center of attention is the humble turkey. Accolades are received at dining tables around the country, and the White House bestows presidential honors on the gobbler. It has become traditional for our president to pardon a turkey (or two) for Thanksgiving. In this official ceremony, the birds’ names are announced and the promise is made that they shall live out the rest of their days in turkey retirement. Sounded a little hokey, but it’s been a nice tradition, until a story by John Stossel on ABC News caught my attention. “It’s kind of a hoax,” Stossel said. “I went to the farm where the birds pardoned by presidents go, and I learned that this is not a story with a happy ending. Do these birds really go somewhere and live out their days in a turkey’s version of retirement? The answer is that yes, they do, but it is not quite what you might think. It turns out the ceremony is the height of the turkey career no matter how you slice it. As far as tradition goes, there are several versions out there about who actually started this. One is that it was with Harry Truman, in 1947, when the National Turkey Federation presented him with a holiday turkey. From that date forward, the White House has received this annual gift from the Turkey Federation. Eisenhower, Kennedy, Johnson, Nixon and Reagan pardoned their turkeys, but it somehow turned into a flock when George H.W. Bush pardoned four and then Bill Clinton eight. Bush embellished the pardon further, calling it the “kickoff” event for the holidays. He added this promise to his two turkeys: “They will live out their days in the comfort and care of Kidwell Farm in Herndon, Va.” A nice thought for the small children watching and fellow animal lovers. How does a turkey get to the White House anyhow? There appears to be a turkey-selection process, with training beginning at birth. This involves socialization around people and choosing birds that have a calm demeanor. Turkeys spooked by noise and camera flashes are eliminated. A pair is selected; this provides an alternate in case of a turkey assassination or if the primary turkey is ill and unable to fulfill its duties. Both are males. Just days before Thanksgiving, the winning pair will be treated like royalty, with first-class plane tickets provided from the farm to the big city and then chauffeured to a luxurious Washington hotel. From there, they will recover from jet lag for two pre-ceremony days with guards appointed at the door. Then they will be delivered to their White House appointment. In the past it has been in horse-drawn carriages, but this year, with cutbacks, it may only be in a limousine. On stage, they will be introduced and finally receive the much-anticipated pardons. After the ceremony, they will be transported to George Washington’s Virginia Estate and become part of the Mount Vernon Christmas display until Jan. 6. Now the question remains: What really does happen to them after Mount Vernon? It appears there is not one turkey retirement home but several. Turkeys have gone to Virginia, California (Disneyland), Florida (Disney World), New York and now potentially Kentucky because the Wild Turkey Distillery wants a spokesbird. Unfortunately, it appears the story does not continue much longer after this, as most turkeys are raised for meat purposes only and are prone to various health problems, all of which are related to their hefty weight gain that results in a shortened lifespan. Disney tried several special diets, but even they could not keep the guests for long. This year’s turkeys will come from Badger, a small town in the northwestern corner of Minnesota. John Burkel’s family farm is the proud donor. The good news is that these turkeys do not end up on the presidential dining table. In honor of past service, here are a few presidential turkey names: Apple and Cider, Pumpkin and Pecan, Biscuits and Gravy, Stars and Stripes, Marshmallow and Yam and last year’s Cobbler and Gobbler. It is too bad that the name-selection process couldn’t include the public’s input. Joni Keefe moved to the Roaring Fork Valley after a career in landscape design. She is passionate about local food and agriculture. For more information, her website is Farmsfinest.com, or follow her on Twitter. Connect at joni@farmsfinest.com.